Selected Villas for rent near Pilgrims Lounge (Sri Lanka) - Contact us now! 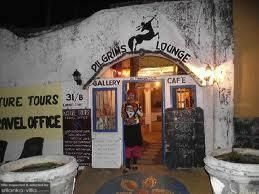 Pilgrims Lounge, a cosy bar with a casual setting, is located close by to the beach. Amble up the steps leading from the handicrafts store on the first level, and you will find yourself in the rooftop cafe overlooking the sea. The cafe offers a selection of Sri Lankan and Western fare, as well as alcoholic beverages. Guests will be immediately put to ease by the friendly and genial service of the staff.